Indian Motorcycle has a colorful history of developing gorgeous motorcycles, it’s fitting that their new Indian Women’s gear lineup is just as beautiful. Total Motorcycle graciously accepted the opportunity to put some ladies gear to the test and recognize some empowered woman riders while we are at it… Being a lady rider means something different to every one of us. To many, it’s doing what all the boy’s said we couldn’t. The pride of upgrading from a pillion to your own saddle. It’s the shiny chrome, rumble of some throaty pipes and the wind in your hair. Or maybe it’s just carrying on a family tradition. Individual reasons aside, we all do it for the same reason, to be empowered women riders. 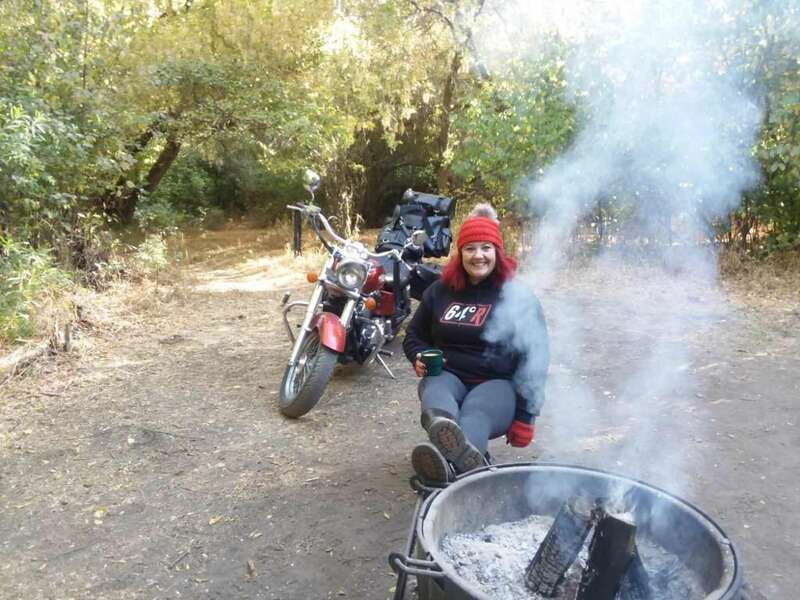 Have you ever had the empowering experience of motorcycle camping? Everything you need for a night or two of tranquility and reflection in nature packed up on two wheels is a venture every rider should experience. I took my Indian Women’s gear with me on the adventure captured in the video and in the photos below, I hope you enjoy it. 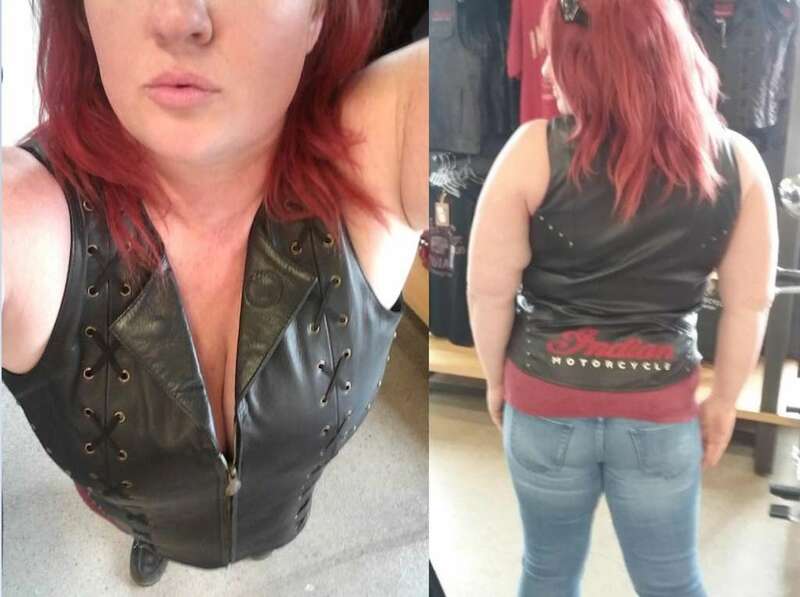 I perused the ladies section at my local Indian dealership and selected the most stunning piece of clothing on site, the Indian Women’s Blaze Vest. It’s now the most magnificent piece of clothing in my gear closet. It has a cute little leather collar and stylish criss-crossed suede laces up the front which accentuated my bust line with some little antiqued brass studs for just the right amount of cup line and side bling. With slit openings on either side of the bottom hem that lace up with the criss-crossed suede it accentuates my shape and is adjustable enough to accommodate any size of hourglass figure. The Indian Women’s Blaze Vest features a matching antiqued brass zipper with a fashionable pull tab embossed with the famous Indian logo. The leather is plush, mega soft and always smells like leather heaven even when I’m engulfed in exhaust fumes at a stop light. Last but certainly not least, a large stitched red Indian Logo is perfectly placed at the small of my back; strangers notice the logo and they immediately wanna talk to me about motorcycles, which I love. 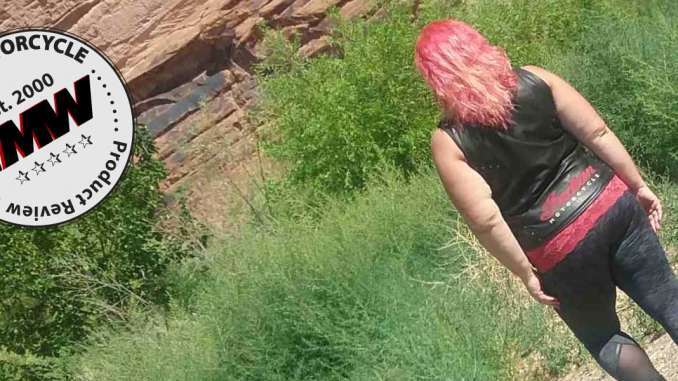 I’ve said it before and I’ll say it again, every lady rider needs a good leather vest. They are perfect for layering with other articles of gear to accommodate a variety of temperatures, they fold up small so they’re easy to take along (because biker girls need to pack light). They have a versatile style so they look great with jeans and a long sleeve shirt on the road and lovely with a skirt and tank that evening at a restaurant. The Indian Women’s Blaze Vest is a must have. I’m impressed with the way my Indian Women’s Blaze Vest fits me. As per my measurements, Indian’s sizing guide for Women’s apparel is absolutely accurate and the length is perfect. It isn’t so short that it rides up and it isn’t so long that it gets folded between my rear and saddle. The openings for the arms are perfect and I have enough room to comfortably layer a long sleeved shirt underneath. It’s comfortable, doesn’t pinch and provides just the right amount of coverage if I wear only a tank underneath. My Indian Women’s Blaze Vest has held up amazingly well. Not including riding to work and back every day, I wore the vest more than 2,000 miles in the 4 weeks I was allotted to review. I traveled cross country in Utah and Colorado when August temperatures reach 102 in the heat of the day and gets down to the 40’s at night and 50’s in the shade up high in the Rocky Mountains. The zipper worked first time every time, all the stitching and embellishments are still in exactly the same condition it was the day it arrived at my door. 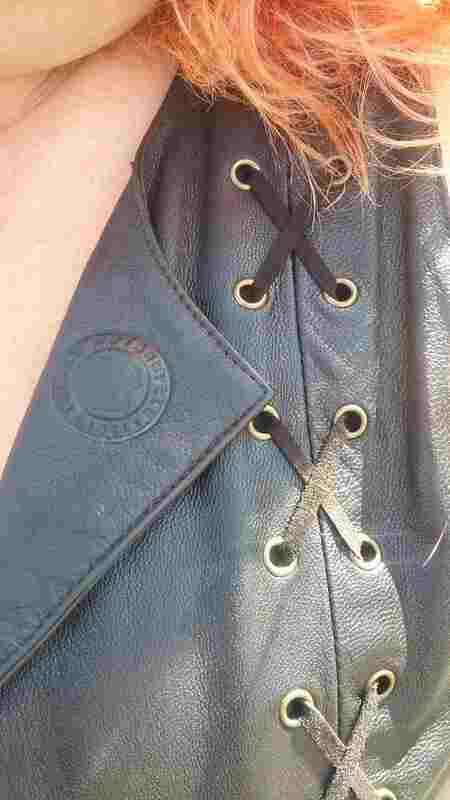 The leather on the Indian Women’s Blaze Vest is so sleek that it moves with my body. It’s also thin so it has no clumsy rigidity like heavy vests or thick leather jackets; yet it is substantial enough to protect my body from large insects, road pebbles, highway debris and it didn’t incur any leather damage. One afternoon I was out for a quick lunch break ride and I got a rare opportunity test how the vest would hold up in a torrential downpour of rain. It kept the majority of my torso dry, and more importantly, even when sopping wet it didn’t bleed one bit of black leather dye on my work clothes. Also, I intercepted a bit of hail while making my way over Douglas pass in Colorado and my torso was remarkably protected! Two small observations I feel obligated to mention. The brass zipper smells like brass when it gets wet (like copper pennies if you’re unfamiliar with what brass smells like) which transfers to my fingers when pulling the zip tab. And, the square shape of the zip tab sometimes swivels and gets wedged at a funny angle but fortunately only requires a bit of re positioning before the zipper can be pulled. The laces in the sides look and feel like suede but they aren’t. They’re real thin and stretchy like elastic but I can’t identify what material they are made of so I had my doubts as to durability. I’m happy to report they are still completely intact and like new. However, while my double knots have lasted my review I have not managed to achieve a bow that stays put. ‘I like being a woman, even in a man’s world. There isn’t much to say about the function of a riding vest. A vest provides minimal coverage when worn alone but the style is classic. 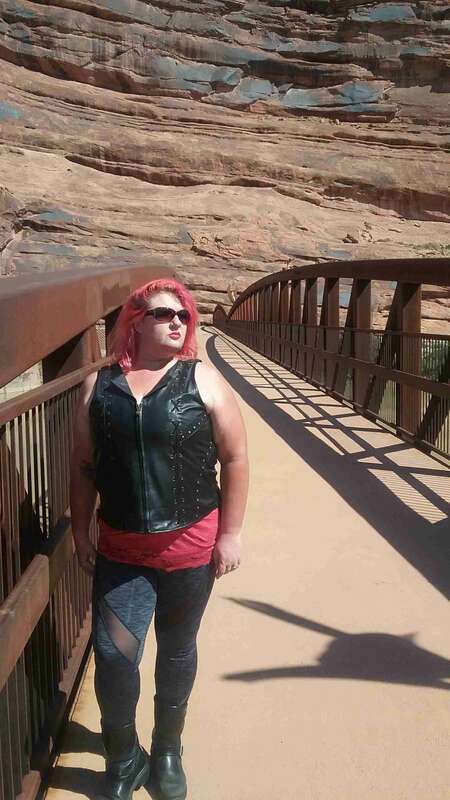 The last time I reviewed a women’s leather vest I made one request. I require a pocket with a zipper to secure my valuables while I’m on the bike or on an outing, for my bike key and a little cash as I prefer not to carry a bike purse or wallet on long rides. Indian has provided us with this one esteemed zippered pocket on the Indian Women’s Blaze Vest, it’s located on the inside over the right breast. That’s the only pocket we get and that’s enough for me. 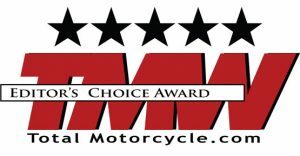 Based on my findings above, Total Motorcycle has awarded the Women’s Blaze Vest with our esteemed Editor’s Choice Award of 5 Stars! Congratulations Indian Motorcycle and thanks for allowing us this special opportunity to review some of your gear. I have received so many compliments from friends and strangers alike and just love how brand talk brings motorcycle communities together. When I go out for a day of cruising the ability to expertly pilot my machine lies within my hands. The comfort, dexterity and protection of a good pair of riding gloves helps me make the magic happen by ensuring throttle precision, ample reach and perfect pressure on the levers. Not to mention abundant grip on my bars. When the the stylish new lineup of Indian Gear was released, the Indian Women’s Retro Gloves caught my eye right away. I love the retro look. The supple leather, intricate red stitching, soft pads and contours over the knuckles, fist and fingers, and the red and white on black contrast brought me back in time. Back to when I was a little girl, my love for motorcycles blooming as my dad and I watched Malcolm Smith and Steve McQueen in a motorcycle documentary after a long summer of learning to pilot my own bike. As a product reviewer I was very eager to get my hands on a pair of Indian Women’s Retro Gloves of my own and had very high hopes for how they would perform and hold up to my abuse. Indian still exceeded my expectations. Unfortunately, I do not own an Indian Motorcycle, yet… (being a proud Indian Owner happens to be on my bucket list) However, I took the opportunity to test these gloves on the two different types of motorcycles that I have and they proved to be flawless on both my cruiser and my sport bike. As mentioned above: Not including my everyday rides to work and back, I wore the gloves over two thousand miles through the hot Utah/Colorado desert in August of all months. I tested the Indian Women’s Retro Gloves in a down-pouring rain and in some nasty hail. Minus a bit of black rubber grip patina on the white leather patches on my palms, the gloves look and feel like new. Let me say, this is the first pair of black leather gloves that I have ever owned that didn’t get black dye on my hands after a rain storm, nor did they feel stiff or creaky after getting drenched in the downpour. They kept my hands cozy and dry the whole time. Disclaimer: The lengthy care instructions are very specific not to attempt to wash these gloves and I will abide. The smooth padding on top provides just the right amount of protection without compromising comfort or dexterity. 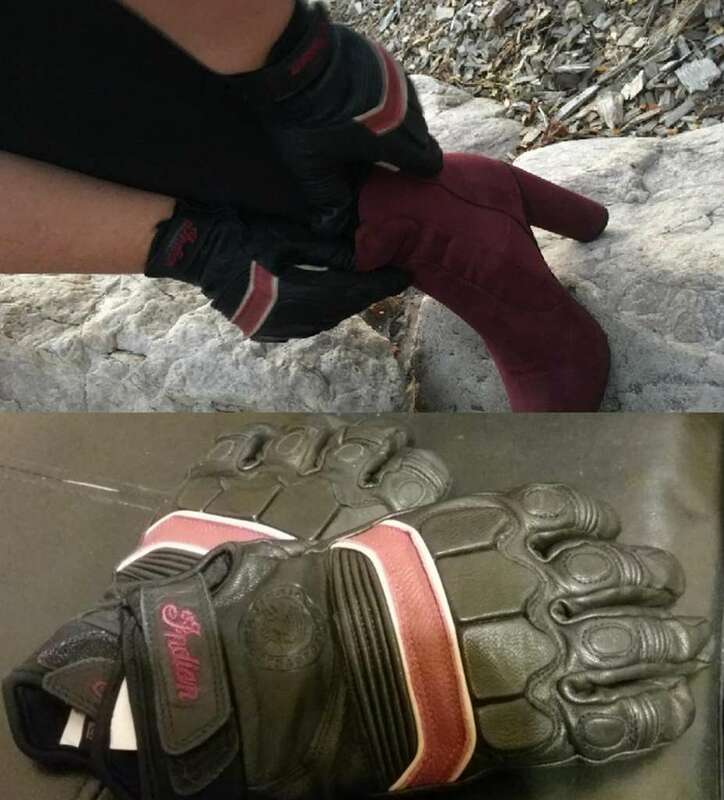 The knuckle armor design is much less rigid than the construction on many other types of armored gloves (For example: my hubby Eric’s Indian Motorcycle Passage Gloves). As a lady rider the wider range of hand agility boosts my confidence. My hands were safely shielded from the desert hail storm, not to mention all the wind, bugs and road debris I encountered on my adventures. The glove shells are made of 96% genuine leather blended with 3% nylon and 1% chloroprene rubber. No doubt a perfect blend of materials made to last as many miles as you want to ride and the vintage style is timeless. Thus, a more than fair trade for the price of $69.99, your hands are worth it! Sizing and comfort is of the utmost importance. I was oh so pleased with the way these Indian Women’s gloves fit my hands. 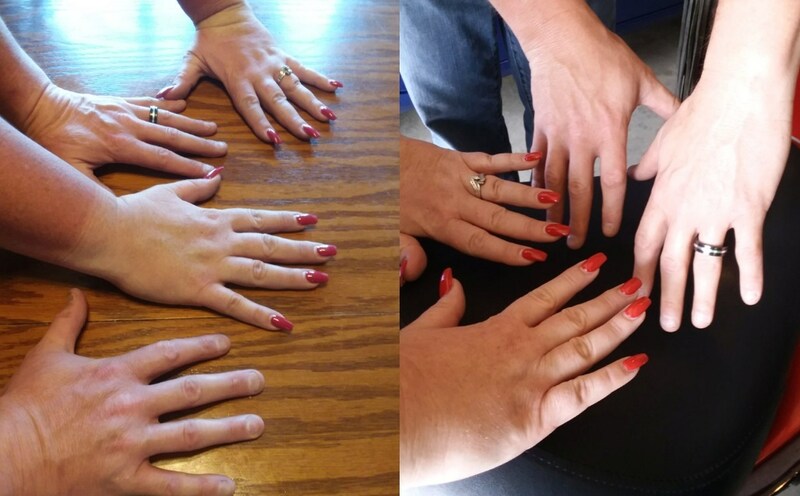 The sizing of the fingers are just right, they allow my fingers to breath and freely bend without restriction yet there is no bulk at my fingertip nor around my knuckles. The finger design includes creases to accommodate the inner side of my bent finger joints. This allows me to freely adjust my holding position at a whim without the leather binding underneath my fingers. Thus, never compromising my grip. I carefully measured my fingers including my lengthy manicured nails yet the sizing guide for gloves on Indian’s website didn’t provide much assistance. It appears the glove sizes on the chart provided corresponds with the measurement from wrist to the end of the middle finger. The length of the tip of my middle fingernail down to the crease of my wrist is exactly 8 inches. Size XL fits me perfectly. ‘Don’t let anyone tell you that you can’t do something. Make your own victories. The glove lining is luxurious. Indian Women’s Retro Gloves are made of shiny black 100% polyester that feels like satin against my skin and the tiny vents in the fingers allows my skin to breathe. The wrist segments are adjustable per a Velcro tab sporting the famous Indian Logo. This ensures a perfect fit every time. After wearing them with the Blaze vest, I tried the gloves with an assortment of both leather and textile jackets from my gear closet and they performed wonderfully. 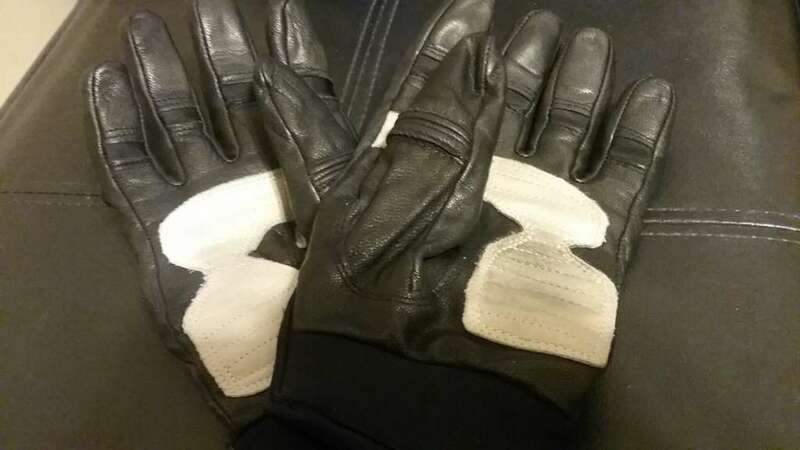 If you’re selecting a jacket to wear with these gloves I advise you to choose one that doesn’t also have Velcro adjustment tabs at the end of the sleeves. Dual Velcro tabs at each wrist could sure get a little tedious. In this day and age, motorcycles are getting more and more technological. My Honda Shadow, old but classic (2003) has exactly one button on the instrument panel, it controls the mileage reset. Just one button is fairly easy to push with any old glove. However a good fitting glove is essential to operating the more complicated instrument panels on newer models of motorcycles, all while keeping your eyes and thoughts on the road ahead. I tested the Retro Gloves on a cell phone screen and they don’t appear to have capacitive touch technology. Because gloves are so important for a quality ride and I had absolutely no complaints about this impeccable design and fit, Total Motorcycle has awarded the Retro Women’s Gloves the Editor’s Choice Award of 5 Stars! I also received a beautiful Indian logo bandanna to complete my ensemble of Indian Women’s gear. A bandanna is an essential and collectible piece of gear every lady rider needs. They hold your hair back in the wind, they show your colors and your brand loyalty. 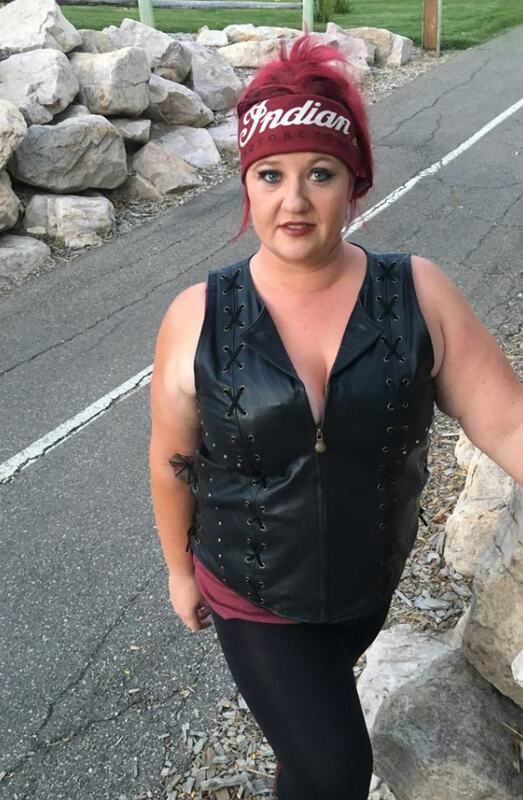 They identify you as the token biker chick in the office, bar or gathering. I always pack a couple spare bandannas on long rides or road trips because they’re just useful to have around. They don’t take up much room, they can pad a loose helmet on a windy day, tie off a leaky radiator hose or even bandage or tourniquet a limb in the event of emergency. Most of my wind sisters have bandannas that tell stories. 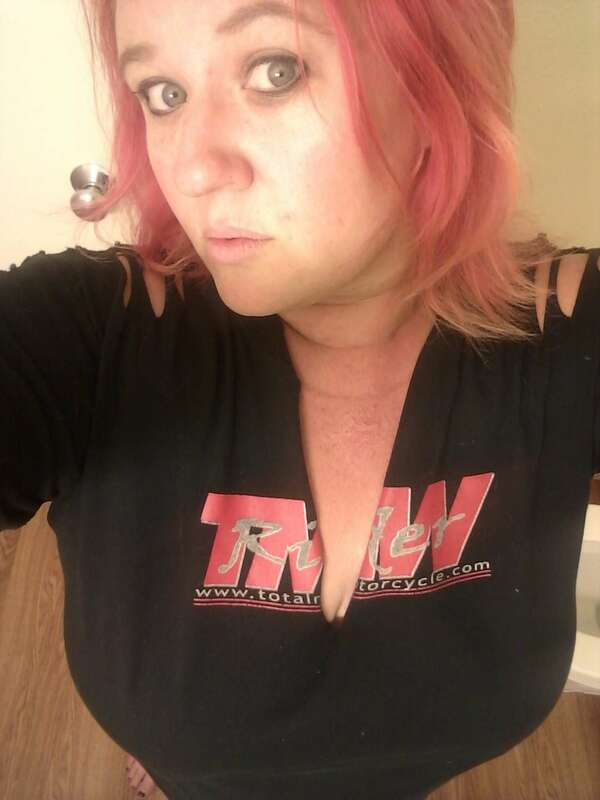 ‘I got this sparkly one at Sturgis 2015.’ ‘This was my raffle prize at the Autism Charity Ride.’ ‘Girl you don’t even wanna know how I got this one!’ I gotta say my Eric wasn’t a fan of bandannas until he took this pic of me. I think we changed his mind. Thank you Indian! What does a bandanna need to do? It’s square, the stitching and logos are perfectly placed and it’s a comfortable blend of fabric. Thus, we rated it 5 stars. ‘”Empowered” has always been my word when it comes to being a lady rider! No feeling like it! ‘I ride because I’m free and don’t think about bills or worries… I ride to let all worries go. ‘I ride because I was raised riding. It’s who I am and I’ve needed to get back to the girl I once was. ‘When I ride, it’s the only part of my day when I’m truly in the moment. crashed it two month later. But I didn’t let it stop me. I bought another bike. Now I am on my fourth bike and have over 40,000 miles under my belt. ‘I started riding because it was very inexpensive transportation, you could get a bike a lot cheaper than a car. Loved wrenching on them, still do. I was one of the only female riders in Utah back then. Here’s what an empowered TMW Lady rider looks like after a long day on the road. Wishing you all happy adventures and safe riding. Keep it shiny side up!